Getting dressed for the day. Getting in and out of the car. Reading stories, singing songs, nursery rhymes. Playing with toys inside and outside the house. Getting ready for naptime or bed. With extended family members and friends. Transferring from one location or activity to another. Curriculum reinforcement: math, reading, science, history, writing. Bubbles, blocks and balloon play. Directions for PVC constructions of slant boards for Talk To Me 100 ® and other voice output devices and switch supports to allow greater access to symbols and communication for individuals with specific needs. Conversational Interaction Form: Use this form to record your verbalizations, then, the behaviors or nonverbal/verbal communications of the child, your response to the child, and so on. The idea is to expand the communication turn-taking from one or two turns within one activity to three, four and five turns. Each week, record the interactions between communication partners for one activity. As the weeks go by, you should see an increase in the number of turn-taking between partners and the quality of nonverbal/verbal skills improve. Articulation Form: The 125 words on the Talk To Me, have been categorized according to sounds in the initial, medial and final positions of words. This form can be used as a tool to identify specific sounds in words that are distorted, deleted or have sound substitutions. For Speech Pathologists, record articulation errors phonemically during the first week of Talk To Me trials. This form is a tool to track changes in sound production. Make notations that are easy for you to interpret. Record progress each month. This form is to alert you to any changes in speech during your partner facilitated communication strategies with the Talk To Me 100 ®. This information may be especially helpful with those apraxic children. I have found “visualizing and verbalizing” with voice output strategies increases articulation skills. Talk To Me First Words Form: The 125 words are listed to identify words that the child has demonstrated comprehension with a star. Identify those words that the child expresses intelligibly with a heart. Throughout initial communication interactions you will be able to determine what words are functional. Repeat this review once a month to track increases in vocabulary comprehension and expression. Blank template with removable individual squares to allow specific windows to reveal target words, reducing visual stimulation. Print 100 square blank template on 8.5″ x 11″ poster paper and laminate. Determine target vocabulary and cut out corresponding squares. You may begin with only 3 to 8 symbols, depending on the ability of your child. Even though this template will not prevent activation of the hidden words, the selected windows will encourage selection and repetition of the targeted vocabulary by both communication partners. Choose vocabulary that can be used in a motivating activity with high frequency. Gradually increase visual symbols as student becomes tolerant of added visual stimulation and increases language skills. 100 word template to allow individualized digital photos of people, actions, places and pictures. Insert or import your photos, symbols or pictures onto the template , print and attach to Talk To Me 100 ®. Print a copy to laminate and cut individual pictures to use as a moveable communication board. Tip: Google Images has an unlimited library of pictures that can be used for a variety of activities. Templates with foreign language words to print on clear 8.5″ x 11″ sheets to place over existing Talk To Me 100 ® symbols: French, Spanish, Italian, German, Chinese, Japanese. According to educators, a vocabulary of 500 words is enough for limited communication of wishes and needs. Basic conversation requires about 1000 words plus some knowledge of verb tenses. With 100 of the most frequently used words for social interactions, you are well on your way to tackling a new language. Think of the rapport you will gain as you travel and initiate interactions with new friends in a new language. Who knows, you may even be able to teach them a few English words. The language templates are particularly useful for adult speakers of other languages who are placing their children in US schools for the first time. Talk To Me 100 ® gives these parents a jump start on learning their adopted language, especially if they do not have opportunities to interact in English like their children do at school. The clear language templates will fit over the 10″ x12″ Talk To Me 100 ® and the print version communication board. Tactile grid to assist visually impaired individuals. Print the 100 square grid on two 8.5″ x 11″ poster sheet, laminate and cut out selected target squares. As child gains comprehension and expressive skills, increase number of cut out squares until each square is outlined with the poster grid. The tactile and auditory feedback from left to right and top to bottom will reinforce location of words. Follow the partner facilitated instructions as you combine language in functional and interactive daily activities. A variety of textures may be attached to the symbols to increase tactile association with a specific word. For example, strands of hair for mother, a piece of a straw for drink, soft material for baby. It is not important or possible to find textures that match all 100 symbols; it is important that whatever you choose to represent that symbol is constant and consistent whenever you use that specific word during your partner facilitated communication. Construct a plexiglass eye gaze board, approximately 12″ x 14″ to arrange your symbols for those children using eye gaze to select a word. Use Velcro, sticky back tape or glue dots to attach your laminated symbols to the board. Hold the board in front of you with the symbols facing the child. 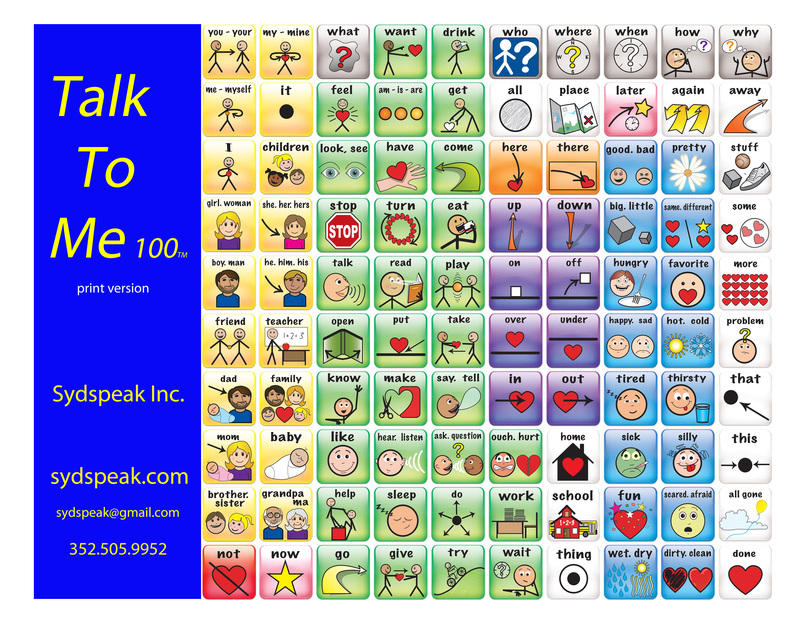 As you engage in an activity, point to the symbol, verbalize it, and press the Talk To Me 100 ®. For example, you may begin with 4 symbols, 1 symbol in each corner during mealtime, (you, eat, drink, more). As the child is eating, you would say “you eat” as you point to “you” and “eat” on the board. Activate “you eat” on the device. Observe child’s eye gaze. If eyes focus on one symbol, say: “you said drink”. Point to the symbol on the board and activate “drink” on the device. Reinforce with a sip of the drink. Continue in this manner, verbalizing, pointing to the symbol and activating the device while engaged in some daily activity.Alternatives: Plexiglass photo displays are useful for displaying symbols. A 3 ring binder is also a good surface to display your symbols: Use a 1, 2, 3, or 4″ binder, attach rough Velcro dots to the covers’ center outside edge, attach a 3″ to 6″ strip of soft non sticky Velcro to the dots between the two covers. Adjust the degree of vertical slant for each child’s individual needs.